We moved in to Old Salt Farm last fall, and we are thoroughly enjoying our first summer here. 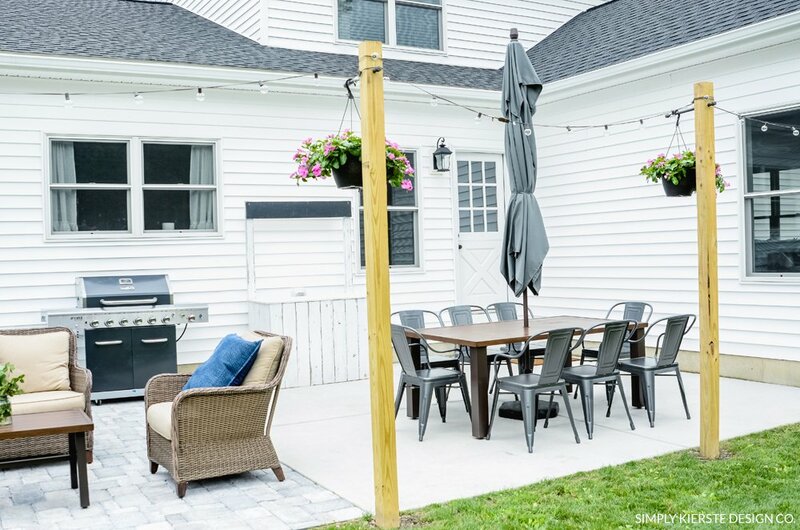 We started out the summer with a huge list of outdoor projects, and at top of the list was a patio makeover. 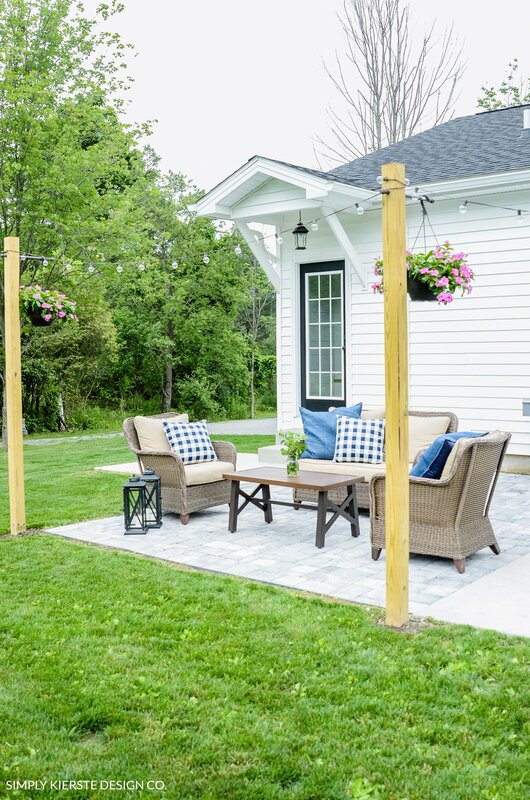 We had nothing but a single cement pad, and knew we wanted to make it a place where our whole family could spend time together throughout the summer. 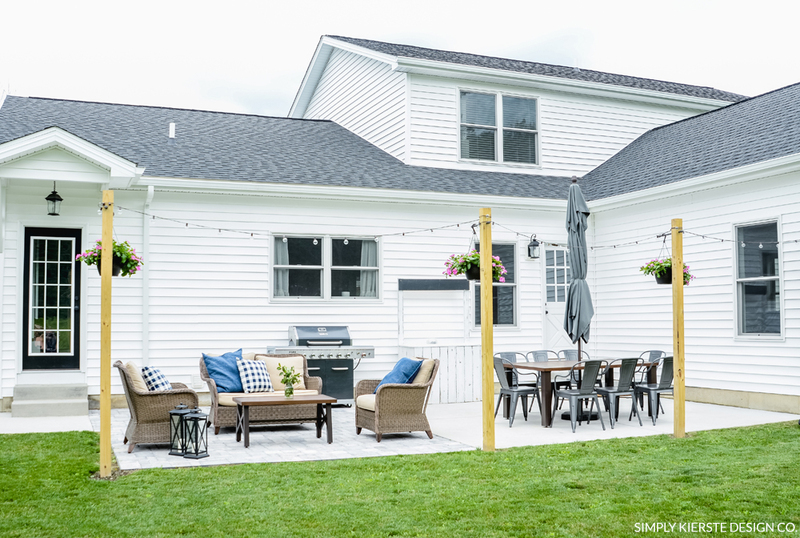 We love being outdoors as much as possible, and here in upstate New York, summers are the perfect time to do that. 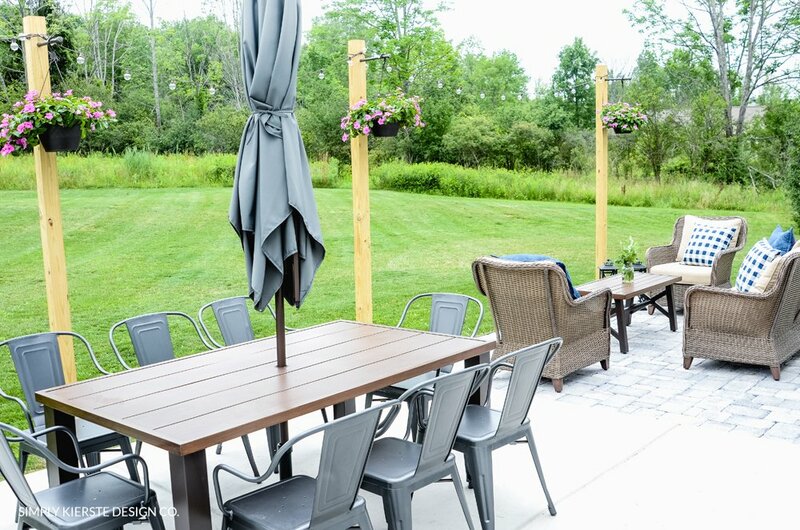 We have spent the last couple of months working on getting our patio ready, and I’m so excited to show you our Backyard Patio Makeover! Can you believe the difference? It’s a completely new space, and we are in LOVE. 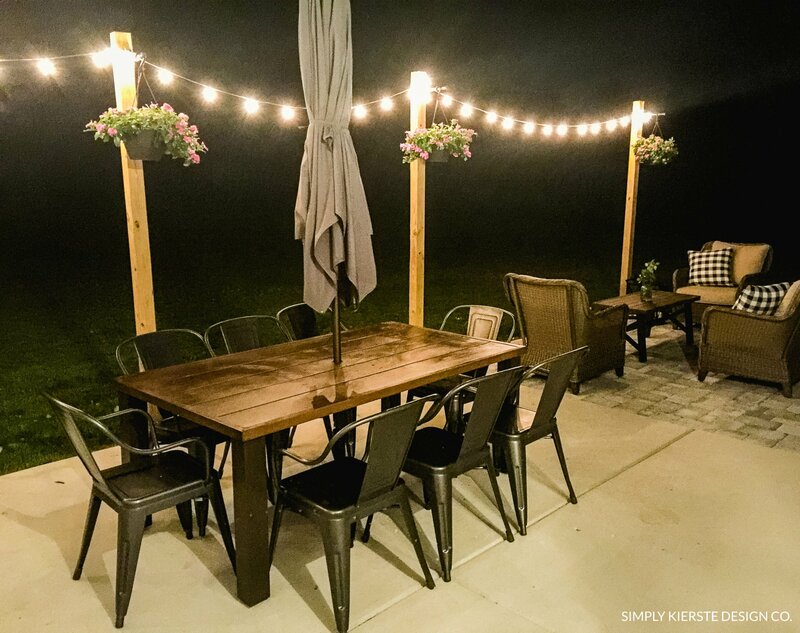 It’s simple, yet totally functional, and perfect for hanging out with our family and entertaining others. A huge thanks to Better Homes & Gardens at Walmart for sponsoring this post. Affiliate links are included for your convenience. As always, opinions about their super cute farmhouse products are 100% mine. 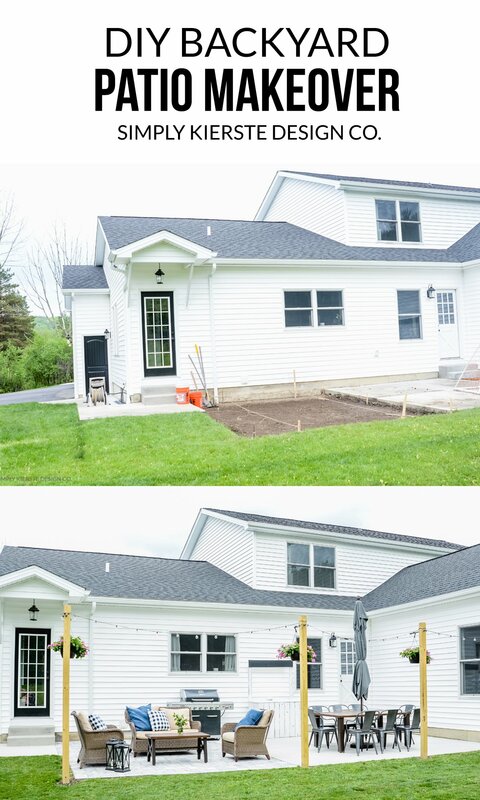 We started with a DIY Stone Patio, which doubled our patio space, and gave us so much more to work with. 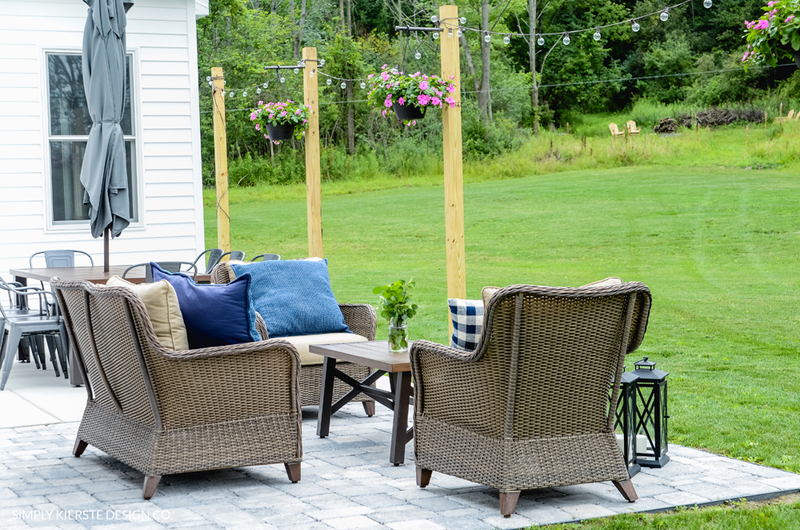 We also added Outdoor String Lights on DIY Posts and hung flowers on them, and that really was an incredible transformation. The pop of color from the flowers really seals the deal! 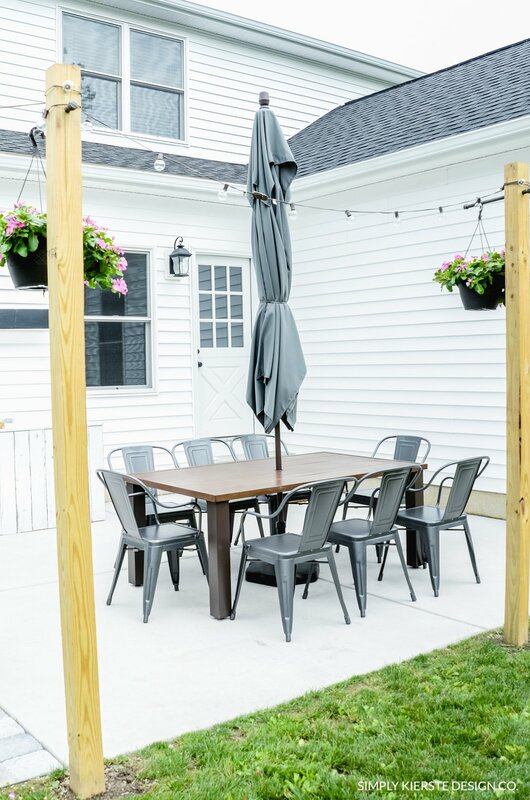 When we finished our stone patio we bought the cutest outdoor table and chairs by Better Homes & Gardens at Walmart that I absolutely adore. It’s perfect for the space, and we could fit eight chairs around it! It’s actually intended for six chairs, but eight works great too, which is awesome, because that’s how many people we have in our family. We eat outside every night that we can, and there’s just something about being outdoors that makes everything taste better! 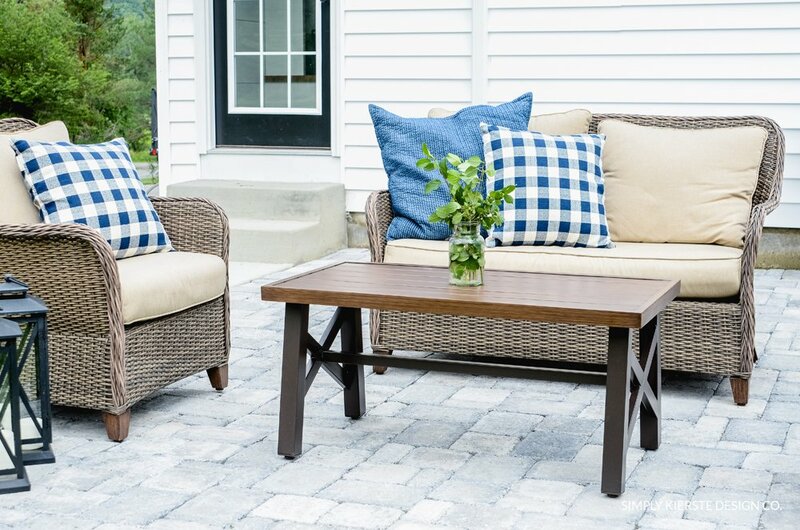 I also wanted a sitting area, and when I saw this Better Homes & Gardens Farmhouse Camrose set, I was in love. I adore the wicker style, neutral cushions (so easy to change pillows and colors), and farmhouse table. 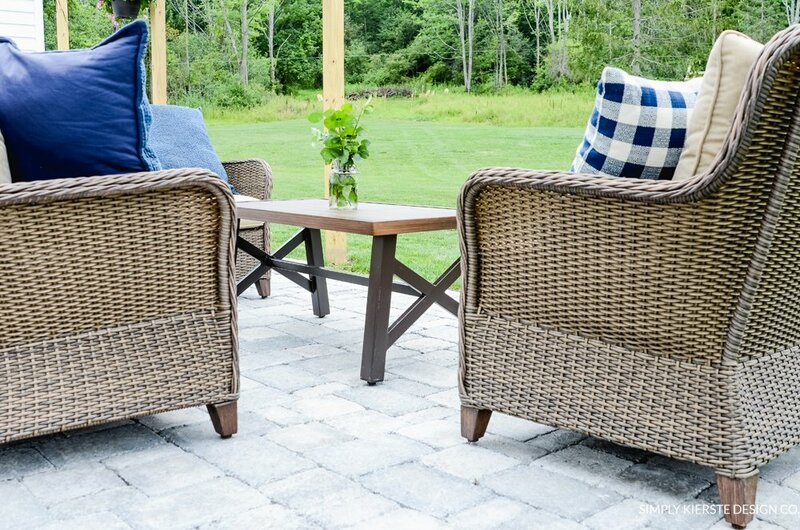 It’s the perfect update on classic wicker furniture with a twist of farmhouse style…my favorite. 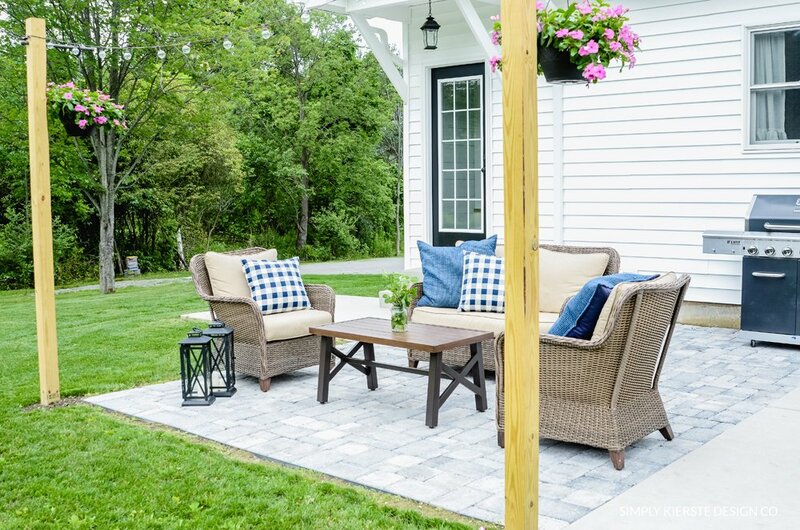 It’s the an awesome spot for talking, playing games, and watching the kids run around the backyard. The metal lanterns are such a fun touch. 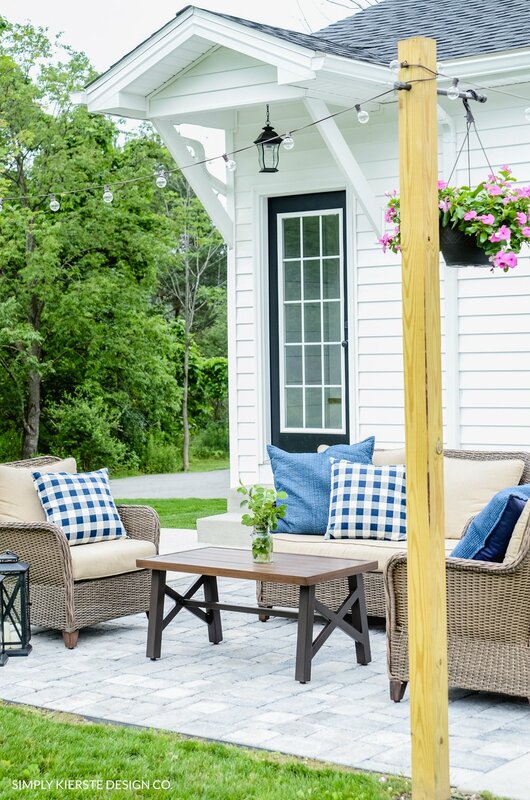 I love lanterns anyway, and the crossbar feature on these outdoor lanterns give them extra charm. I like to clip greenery from my yard and put it in mason jars–it makes the perfect centerpiece for a table, or other space, and it’s FREE! 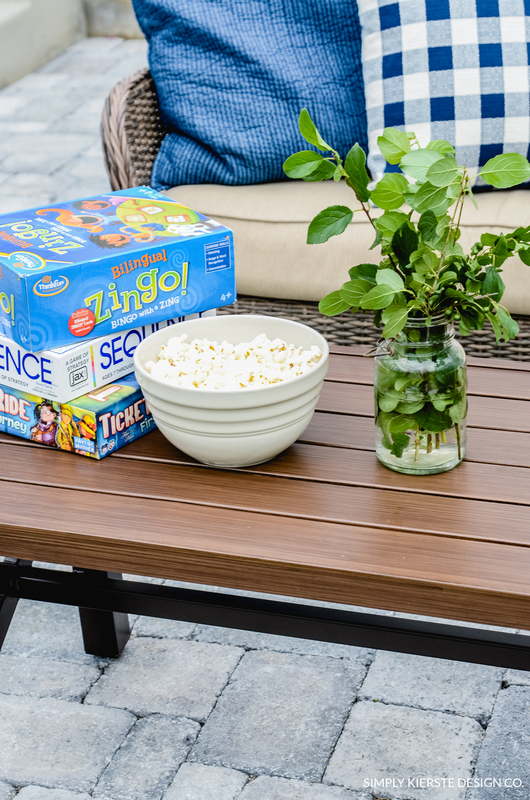 Board games and popcorn are two of our favorite things and nothing beats playing them outside on a beautiful summer afternoon or evening. When it gets dark, all we have to do is turn on our super cute string lights! It really has created a place for our family to be together and that’s the best part of all. What a great outdoor space! The wood poles and string lights almost make it into a room! 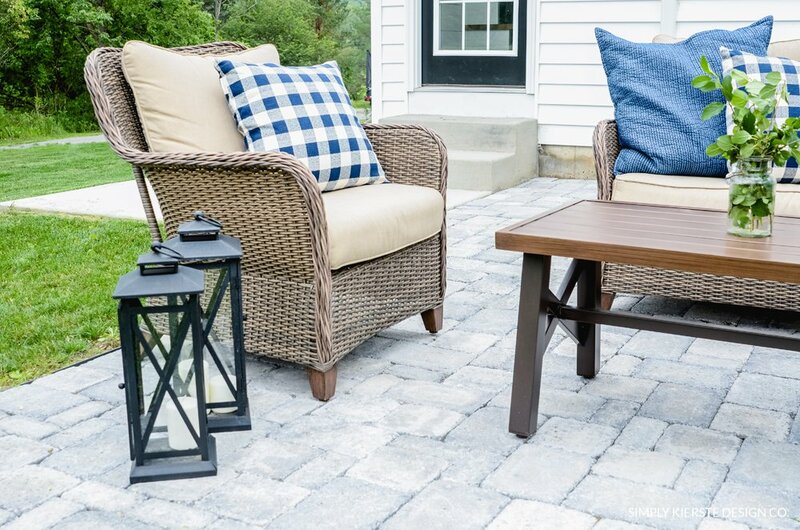 I love your patio makeover! I’m looking forward to seeing your string lights poles tutorial. I do leave the furniture and cushions out all the time, but bring the pillows inside at night. They do great! We had a ton of rain last week, and I wondered how they would do, but it was totally okay! LOVE!! Did you make the pillows on the Camrose set or purchase them from Wal Mart as well? Thank you, Cindy! The pillows came from Pottery Barn (the gingham ones), and the denim ones are from Target! 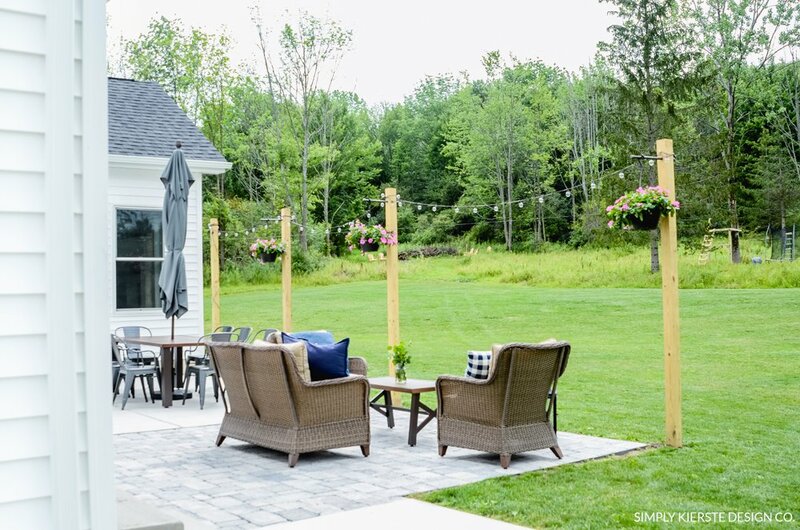 What a lovely outdoor living space! Easy to hose down to clean, nice to cut down on dirt coming into the house. You will find great ways to use the heat from the concrete, too. A rack of delicates you don’t want to go through the drier, setting a jar of sun tea out, a pan of flower petals that need to dry, etc. You will find a lot of heat gets radiated back from the concrete. Years ago (when I was married to a cement truck driver), I had a clothesline with a cement pad under it. I couldn’t believe how fast clothes dried; not to mention my legs weren’t being attacked by rogue wild raspberry bushes! Also a great place to draw a hopscotch game or other sidewalk chalk projects. Enjoy! Forget the tutorials, I want to come live with you. You have some awesome ideas. Keep them coming, we all enjoy living vicariously through you. love your ideas. Thank you for sharing. I want to have a wonderful space like it too. 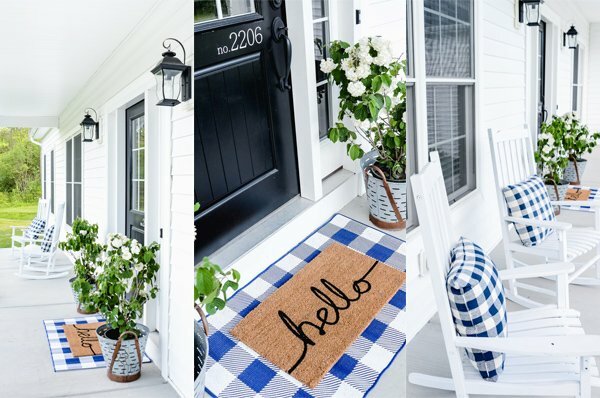 Love how it all looks and the Farmhouse Camrose collection from BHG. I could live out here!! Great space with a beautiful view! Love it all! YAY! I’m so glad you found some you like! Were you able to decide which one? 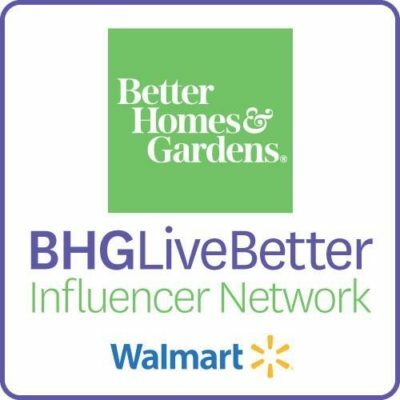 :) I love the Better Homes & Gardens line at Walmart–I always check there now to see what they have! Can you tell me how deep the 4×4 posts are buried/cemented in ground? And assuming they’re 8′ tall? Girl Power: Just finished a 14′ x 22′ deck…..have 6 strings of Edison bulb lights…..just need strong posts to attach them to! Excited to decorate, now that most of the hard work is done!! This looks awesome. You did such a great job, thanks so much for sharing!